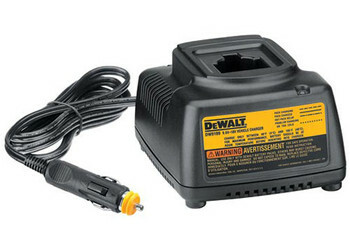 Dewalt 7.2V-18V 1 Hour Vehicle Charger. Charges DEWALT batteries from your vehicles power outlet (except Univolt®). Charges in 1 hour or less. Automatic shut-off protects excessive discharge of vehicles battery. Charges all DEWALT® 7.2V-18V batteries (except Univolt batteries) so users need only one charger for multiple cordless tools. Patented voltage booster circuitry charges whether vehicle motor is running or not for more flexible use and convenience for reduced downtime. Circuitry boosts input voltage to allow recharging one battery after another to save time and improve productivity.